Enjoy this scrumptious recipe with a delicious cup of tea or coffee in the morning. 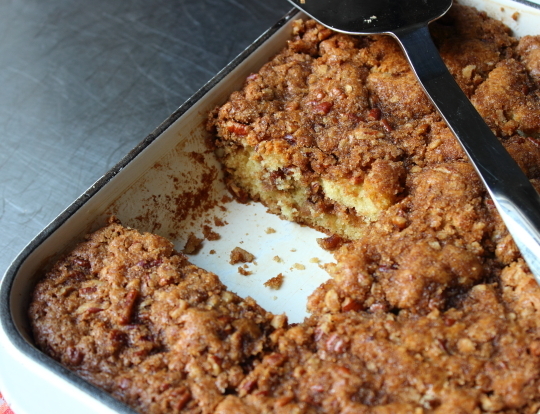 Mix brown sugar, cinnamon and nuts together and set aside. Cream butter and sugar (I do this for a very long time until really creamy) beat in eggs, vanilla and sour cream. In another bowl mix flour and baking powder; add to creamed mixture. Next use a pan (13x9x9 suggested) and put a shallow layer of the cream mixture, then add a layer of nut mixture, repeat layers until gone. For a fun and cute finish, take a knife and swirl the top for decoration.